Disclosure: I received these items complimentary, but all thoughts and opinions are my own. This post contains affiliate links. As our world gets busier and busier with work, child care, errands, you name it, it can be easy to forget to make time for a date night. While our windows of time to have date nights with my husband are short, I have been looking to come up with ways to make the most of our time together in short amount of time. While going to the movies or a show can be fun, we don’t really get to talk to each other and catch up. So it seemed like the best solution would be to have a nice dinner together! I recently received this adorable Mickey Mouse picnic backpack from Picnic Time. The outside is black with silhouette Mickeys, and inside there’s plates, silverware, cups, and adorable napkins with Mickey Mouse embroidered on them. To the side is a Mickey Mouse fleece blanket for a picnic! 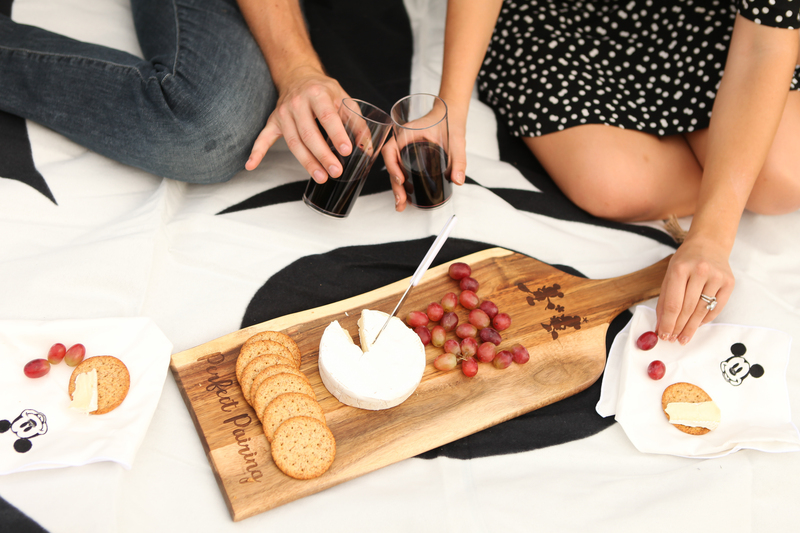 That along with an adorable Mickey and Minnie cheese board made for the perfect items for a Mickey and Minnie picnic date night for this Disney-loving husband and wife! Even before the date night started, the bonding time started when we planned our picnic together by going to Trader Joe’s to pick out items to put on our Mickey and Minnie Picnic Time cheese board (brie was a must!) along with our wine. Maybe it’s because I’m a foodie, but I love going to the grocery store with my hubby to shop together and pick out food! It’s the simple things, right? Next, we set up our Mickey blanket, napkins and board, poured wine into our cups, and had our picnic near sundown in our front yard. Between shopping beforehand, and then enjoying good food and wine in the fresh air together made for a simple yet incredibly special and memorable date night, and most importantly, quality time to reconnect. If you’re a Disney-loving couple just like us, you can find the Picnic Time Mickey Mouse picnic backpack here and the cheese board here to have your own Mickey and Minnie picnic date night!